APPBuilder is a tool that can drastically increase your Hollywood multimedia language productivity, infact with this application you can compile and pack your cross-platform project with a single click without bothering with long shell commands. In a standard environment, if you will to target multiple platforms and you are using plugins, you would have to build your executables and manually you have to pack them including the right plugin for every target OS. This process can lead to mistakes, copying the wrong plugin or putting it in the wrong folder. 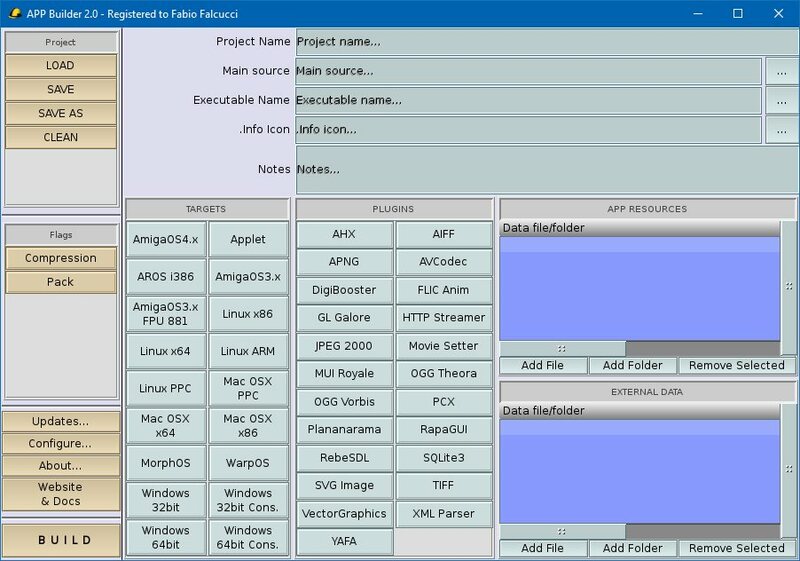 If you are building your applications for multiple platforms this utility is a must have! This application let you choice for which target platforms you want to build, you set up your main source and what Hollywood plugins your application needs, and you are done: the software will manage for you all the boring things like copying the correct plugin version in the correct target platform folder. APPBuilder has been developed because of my personal needs: compiling for all platform (when possible) supported by Hollywood it’s not easy, especially when come the time to compile the application and build the distribution packages. You have to make extreme attention to copy the right data in the right folders for each targeted platform, and for each target you have to provide the right plugins if your application makes use of them. Please go to the application home page for a more detailed description. Due to Hollywood 7 update now also APPBuilder offers full support to UTF-8 encoding. Previous Post Previous post: New songs released! Thanks to you for the feedback!